Happy Tuesday! 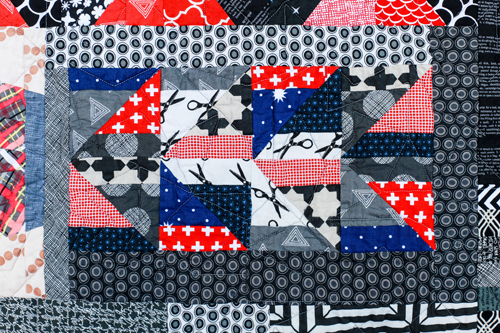 Today I have a special quilt finish to share. 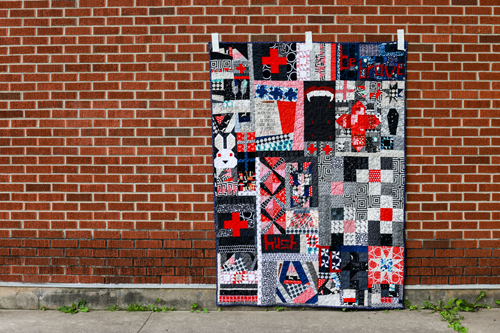 For the past year and a half I've been a part of a traveling quilt bee with some really lovely ladies. 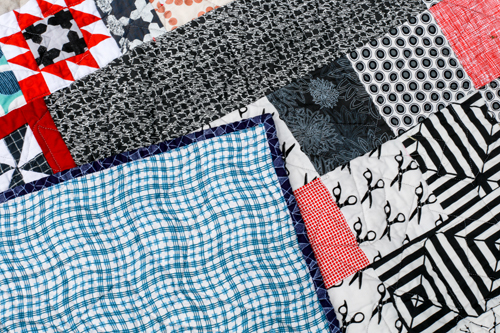 Our bee is called Fantastic Quilt Voyage, and you can see the blocks we've been making in the hashtag #fantasticquiltvoyage on Instagram. 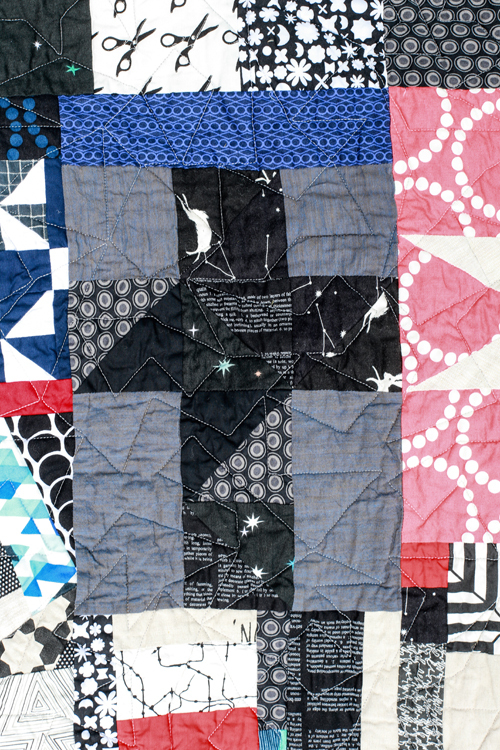 We each started our own quilt, and then it is passed along to each member and they add to it. 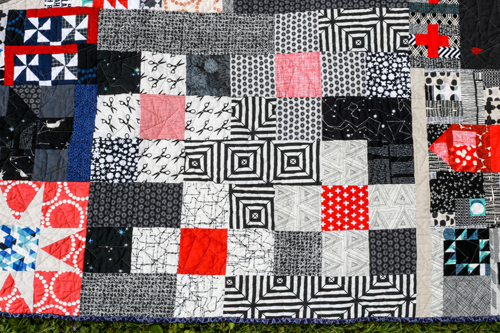 I haven't posted any of the blocks I've made, but I did share my quilt start last February, in this post. 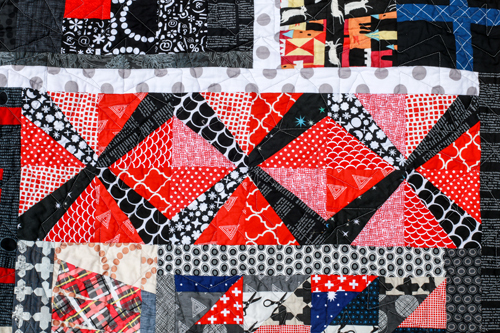 I need to do a catch-up post with all the blocks I've made for each person's quilt at some point. 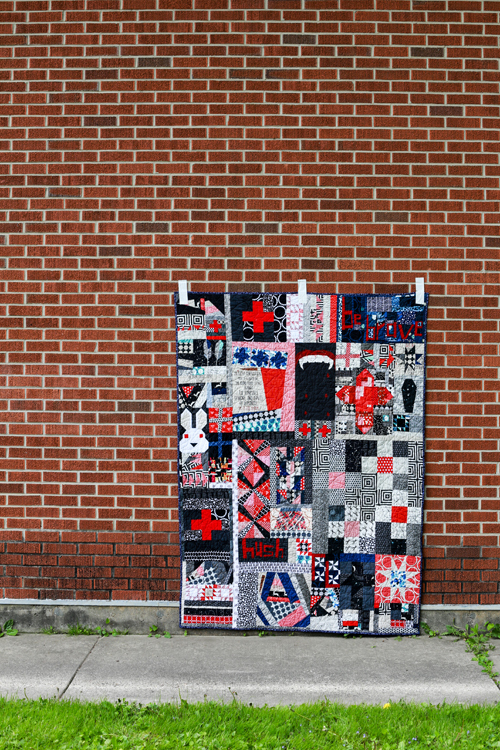 When my sweet friend Amanda became unable to finish her quilt, I offered to put it together and finish it for her. I happened to have her quilt to work on at the time, so it just made sense. 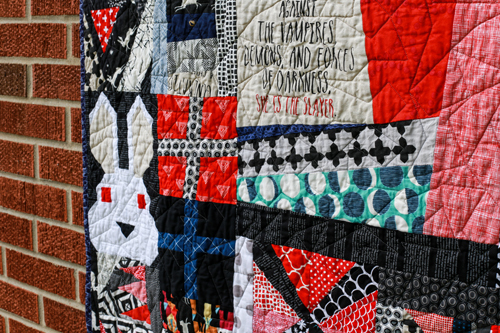 Her quilt had a Buffy theme, so vampires and Amanda's signature black, white, red, navy, and a pop of aqua color scheme. You can see some of her inspiration here. 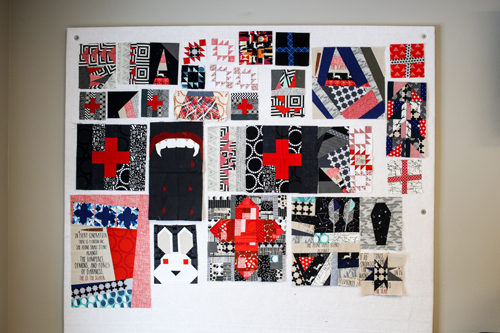 I brought the blocks that had been made so far with me to the retreat I attended at Stitch Supply Co. in January. I made a few blocks that weekend and a few friends made some blocks too. I drafted up this interlocking plus block, I needed something big to fill that space! I made a few blocks using Carolyn Friedlander's Sessoms pattern. Some simple wonky cross blocks. 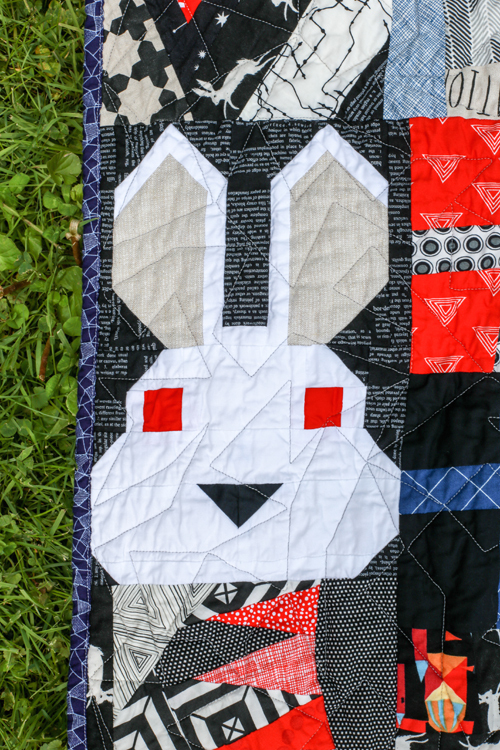 I made a Monty Python inspired crazy-eyed bunny using Elizabeth Hartman's Bunny Pattern. 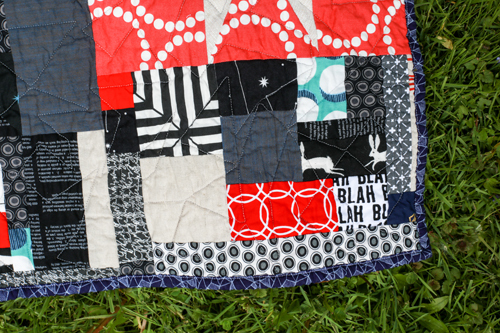 I made use of scraps and made a few scrappy improv blocks. I drew up with cross made from half-square triangles early on and was glad I could squeeze it in. 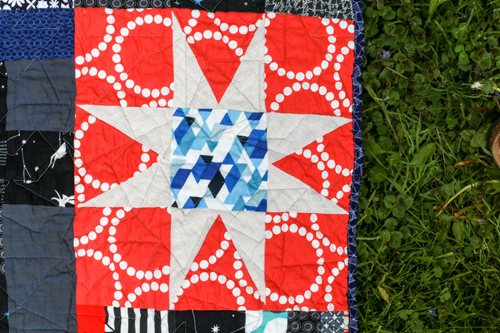 Extra pointy star block from my Shining Stars Sampler Pattern. 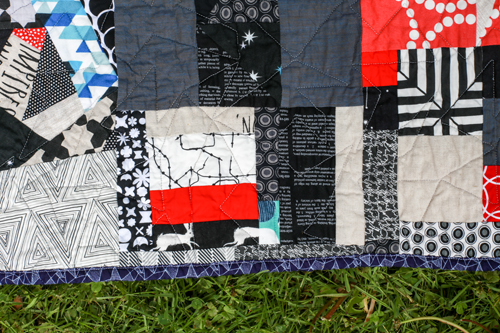 And finally some funky striped half-square triangle blocks. In an effort to use my stash, I pieced the backing. I used a favorite print of Amanda's (from Luxe in Bloom by Sarah Watson) for the binding. I sent the top to Melissa of Sew Shabby Quilting for quilting. 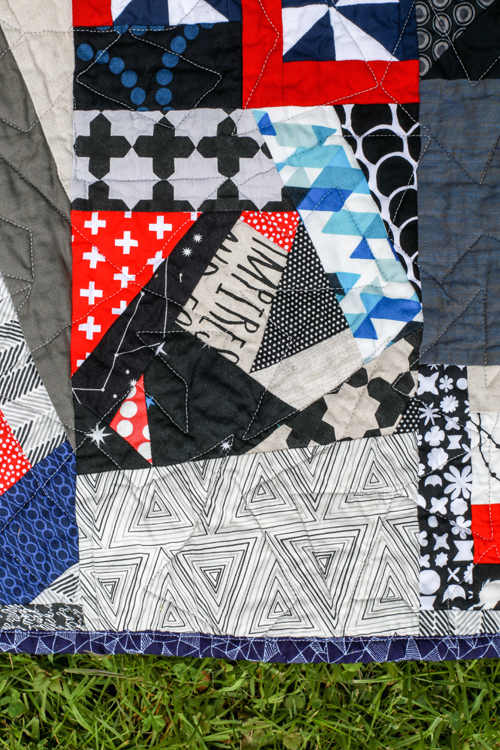 The crackle pattern seemed like a perfect match for the theme of this quilt. I needed a way to transport the quilt and decided to make a set of pillowcases to go with it. 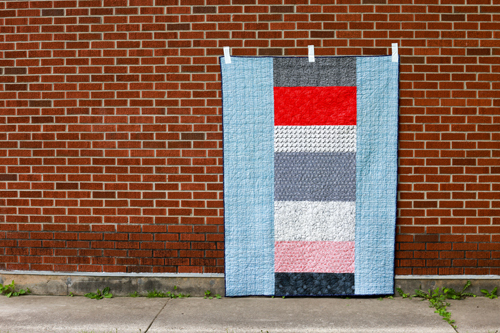 This is my favorite way to gift quilts. 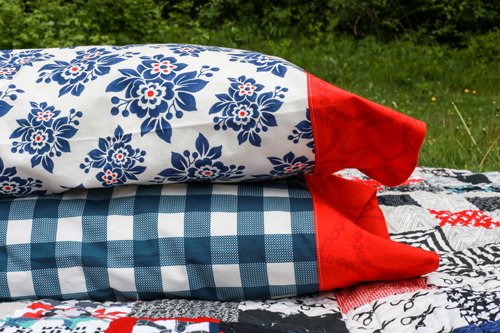 Most quilts can fit comfortably folded up inside a pillowcase! I use this tutorial when I make pillowcases. You went above and beyond with this, friend. My heart is still full. thank you so very much. 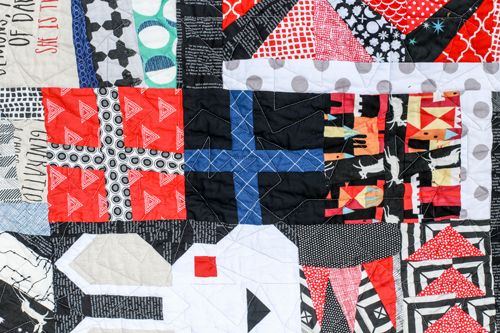 What a spectacular quilt, and a great way to do a round robin. Very generous of you to finish it up! As a gigantic Buffy fan, you totally rocked it! You did a wonderful job and so much work. You know it is much appreciated. I love seeing all those fabrics in so many different patterns. 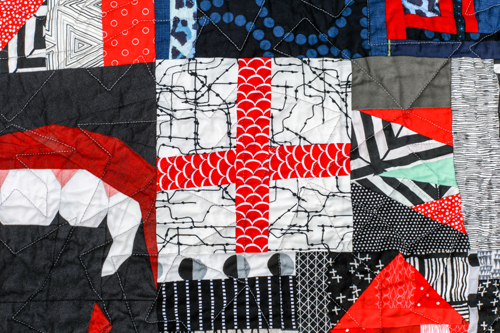 I love the lack of an obvious grid in this quilt. It has such freedom and creativity. This was such a treat to see. Thanks for sharing!